When the American and British governments announced they were closing their embassies in Yemen during the holidays following threats from terrorist groups there and the attempted bombing of a US plane, the moves made headlines around the world. Canada, however, had no embassy to close. This despite the fact the Yemeni government has been asking for one for years. In fact, in the eyes of many, Canada's diplomatic and aid presence is regrettably minimal, despite being one of the largest foreign investors in Yemen's oil sector, and the Middle Eastern country's emerging importance as a new haven for terrorists. Yemen, located on the southwestern tip of the Arabian Peninsula and next to one of the busiest shipping routes in the world, has been thrust into the spotlight after the failed terrorist attack on an American aircraft on Dec. 25 was linked to an al-Qaeda branch there. Al-Qaeda gathered a stronger presence in Yemen after the group was repressed in Iraq, Afghanistan and Saudi Arabia. Rebellions and political unrest in the country make the security threat more challenging for the Yemeni government. Yemen became a republic in 1990 when North Yemen, under the control of the Ottoman Empire until 1918, formally united with South Yemen, which was under British control until 1967. In 1994, a civil war erupted between the central government in Sana'a and southern armed forces fighting for South Yemen's secession. Since 2004, the rebel group Houthis has been leading an uprising in the northern area of Yemen against the government. Besides dealing with these internal issues, the Yemeni military has also been conducting air strikes against al-Qaeda hideouts. Canada has an honorary consulate in the capital Sana'a, but it is formally represented in the country by the embassy in Riyadh, Saudi Arabia. The Yemeni government has been asking for a Canadian embassy in Yemen for years. 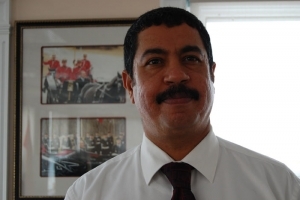 According to Yemeni Ambassador Khaled Mahfoudh Bahah, Canada had planned to open a mission in the country in 2008, but security concerns likely delayed that. More recently, in November, the Canadian government stated its intention to open a trade office in Yemen. Mr. Bahah said although his country would prefer an embassy, "what is more important is the presence, under any kind of terms, as long as it serves the interests of the two parties." The news about the trade office is a good step, he said. "We are not talking about 'yes' or 'no,' we are talking about 'when.' That's more important." The Yemeni ambassador has also been asking Canada and the international community for financial and intelligence assistance in fighting terrorism. In October 2000, al-Qaeda claimed responsibility for a suicide attack against a US Navy destroyer harboured in the Yemeni port of Aden. Seventeen American sailors were killed. In September 2008, a car bomb exploded in front of the US Embassy in Sana'a, killing 16 people. CIDA needs to add Yemen to the official list of aid recipients to help increase the standard of living in the country and to weaken the al-Qaeda threat, Mr. Bahah said. The Middle Eastern country is one of the poorest countries in the world, ranking 140 out of 182 countries listed in the 2009 UN Human Development Report. The illiteracy rate in Yemen stands at 50 per cent, while the female illiteracy rate is 70 per cent, according to Mr. Bahah. Mr. Bahah noted that a Canadian warship is involved in the NATO-led counter-piracy operation off the coast of Somalia, watching for Islamist militants crossing the Gulf of Aden into Yemen. At the same time, a high-ranking Yemeni government official will travel to Canada in about a week to meet with Canadian counterparts to advance relations between the two countries. "Canada has a military presence at the Horn of Africa, but we are looking for more than that," he said. "We are looking for a lot of support. We have good expectations from this meeting." But despite recent developments and revelations about the instability rocking Yemen and worries over the growing threat of terrorist camps within its borders, there are no indications Canada is rethinking its relationship with the country. While the government expressed concern about stability in Yemen at the beginning of this month, Natalie Sarafian, a spokeswoman for the foreign affairs minister, said CIDA is not currently considering adding Yemen to its official aid recipients list. In addition, plans to open a trade office are now on hold because of security concerns, said DFAIT spokesman Rodney Moore. Canada should show initiative in dealing with Yemen, said Mokhtar Lamani, senior visiting research fellow at the Centre for International Governance Innovation in Waterloo, Ont., and former ambassador of the Organization of the Islamic Conference to the UN. "Canada can play a very positive international role," Mr. Lamani said. "The capabilities are there and the image is there, and Canada could lead by bringing together local, regional and international players." This would allow for more international independence, he said, pointing to the Canadian government's 2003 decision not to send troops to Iraq. "By showing initiative, Canada can gain credibility, but unfortunately Canada is more aggressive on the economic side, rather than the political side in Yemen." Calgary-based energy company Nexen began production in Yemen in 1993, and is now running the country's biggest oil project. Mr. Bahah worked for the Canadian company in the 1990s. Mike Harris, Nexen's vice president of investor relations, said he is concerned about the situation in Yemen, but also explained that his company has never had to shut down operations because of security reasons. A small bomb exploded near Nexen's headquarters in Yemen in April 2008, but there were no injuries. "We have been running a very successful operation in Yemen, and we are confident our investment is fine because we have developed a good dialogue with the Yemeni government," Mr. Harris said. His thoughts were echoed by Lloyd Herrick, vice-president and chief operating officer of TransGlobe Energy Corporation, another Canadian company with investments in Yemen. "It's a bit disturbing to see these rebellions unfold, and the al-Qaeda issue is more concerning, but we've always been comfortable working in the area," Mr. Herrick said. Since Yemen appeared in the spotlight, Mr. Herrick said he has been getting calls from worried shareholders. "We explain we operate in remote areas and the security situation does not affect our business. Yemen is a better place to do business than what the public perception holds." These firms factored in the risks when they decided to invest in Yemen, said Matteo Legrenzi, a University of Ottawa professor specializing in the Arabian Peninsula. "They won't be deterred, but they might choose to put more money to increase their security." Although Canadian trade relations do not appear to be at risk, Mr. Legrenzi said the ongoing northern rebellion in Yemen reflects the state of the balance of power between the government and tribal groups. "If the government cannot impose its authority, it's difficult to prevent terrorist groups from hiding there," he said. Mr. Bahah said it should be clear that "direct military involvement [by other countries] is not something preferred by us." In terms of resources, Yemen would value Canada's expertise in coast guard training and equipment, as well as help in developing Yemen's institutions, he said. "Even though we have announced democracy, we are still an emerging democracy and many of our problems come from us as politicians, so we—as the government—need more education."